Does a Push-Up Use Both the Pushing & Pulling Muscles? The pushup solely works your upper body pushing muscles. Your muscles always pull on your bones to create or control movement, but they’re often distinguished between either pushing or pulling muscles based on the type of movement they create. A pushing movement in the upper body involves moving resistance straight away from you. The pushup is entirely a pushing exercise. Although the pushup requires you to raise and lower from the floor, it’s still your pushing muscles that are controlling the entire movement. To correctly perform the pushup, lie face down on the floor and place your hands on the floor so that they’re slightly wider than your shoulders and your fingers are pointed straight ahead. Lift your body off the floor so that you’re holding yourself up onto your hands and toes. Lower your hips so that your torso and legs create a straight line. Bend your arms to lower your body toward the floor and keep going until your elbows are bent to about 90 degrees. Extend your arms to push your body off the floor. The major muscle involved during the pushup is your pectoralis major, which is the largest muscle in the chest and considered a pushing muscle because it moves the resistance away from you. The anterior deltoid, which is the front of your shoulder, and your triceps brachii at the back of your upper arms, are both considered pushing muscles and are also recruited during the pushup. The pectoralis major, anterior deltoid and triceps brachii are responsible for lifting and lowering you as you complete a full pushup rep. The difference is that they are either contracting concentrically, which means the muscles shorten during the contraction, or they are working eccentrically, which means they lengthen during the contraction. For example, as you lower to the floor, your chest, shoulders and triceps are working eccentrically. They’re lengthening as they fight the pull of gravity to control you to the floor, preventing you from collapsing onto the ground. As you push yourself off the floor and come up out of the pushup, the collection of three muscles work concentrically. The pectoralis major shortens as it squeezes your upper arms together. 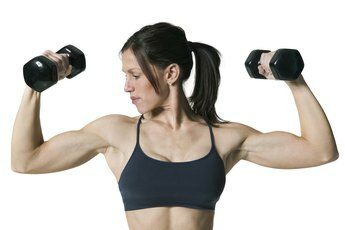 The anterior deltoids shorten as they flex your shoulders and your triceps shorten as they extend your elbows. The collection of upper body pulling muscles includes your latissimus dorsi in the back, the posterior deltoid at the back of your shoulders and your biceps brachii. 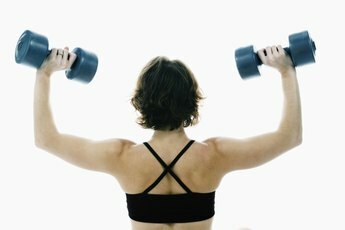 To work these muscles, perform pulling-based exercises, such as pullups, chinups or rows. The back, posterior deltoid and biceps contract concentrically as you pull your body up toward the overhead bar during pullups and chinups and as you pull the weight toward you during rows. They work eccentrically as you control your body back down out of the pullup and chinup and as you control the weight away from you during the row. Do Barbell Rows Help With Pull Ups?